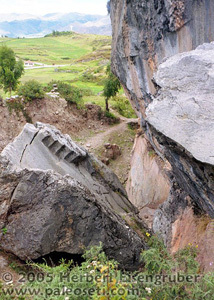 Here above the Inca fortress you can see something unbelieveable: A whole mountain out of granit was carved out! With the following photos I try to show you how the rocks were carved here. It's simply stunning how seemingly effortless the ancients worked ultra hard granit. The rocks look like they were cut like butter with a knife. Here the visitor can see a panorama of extraterrestrial - sorry - highly technical quality! First there this structure right across the fortress Saqusayhuaman (you can see it in the background) that is cut right out of the rock. It's called the "Inca's throne", because it is believed that the Inca emperor watched the construction of the great wall from there. Here a closer look at the Inca's throne. Please look at the razor sharp edges and the precision of the cuts. 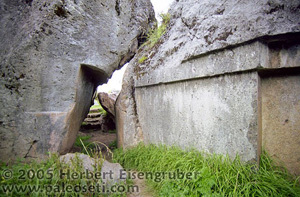 Official archeology tells us that this was achieved with crude stone tools. Can you imagine how long it would have taken just to carve or cut one step? No, I think a different technology was used here. See below for my explanation. And then it get's really strange! This rock looks like it was carved with a butter knife. 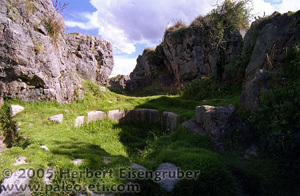 The theory that the rock carvings up here was simply the quarry for the wall of the fortress doesn't work. 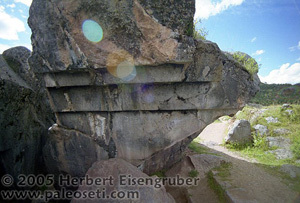 Some of the carvings up here are much older then the wall of the Saqsayhuaman fortress. Also the rocks in the wall have irregular shapes while the cut outs here are straight. Also the cuts in the rocks up here are polished. If this would have been a simple quarry, polishing the rock would not have made sense. ... an then you mouth will just stay open. 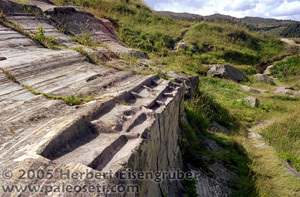 Steps are running from top to the bottom. the same stone block as seen from the side. Up here every rock was carved. Walls were cut lick butter and polished. Everything looks as it was cast in concrete. 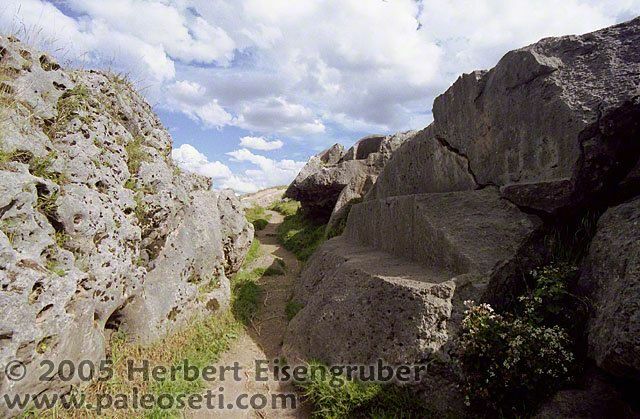 But the rock is not concrete, but natural grown granit. It is also very strange that the rocks are carved in places were an artist can't reach with a chissel or similar. You can see that in this photo on the rock in the background. Everything up here looks as it was put upside down. A whole "labyrinth" was carved out here. Everything was polished. You can guide your hand across the rock surface without feeling rough spots or a raised area. Everything was carved! You can walk around for hours and find something new behind every corner. Please take your time and study this rock a bit closer. You will see that EVERYTHING on it was carved. Why were rocks up here carved the way they are? In the background you can see a big round field. It's really a gigantic stone circle as it is completely surrounded by rocks. The area is certainly artificially made. 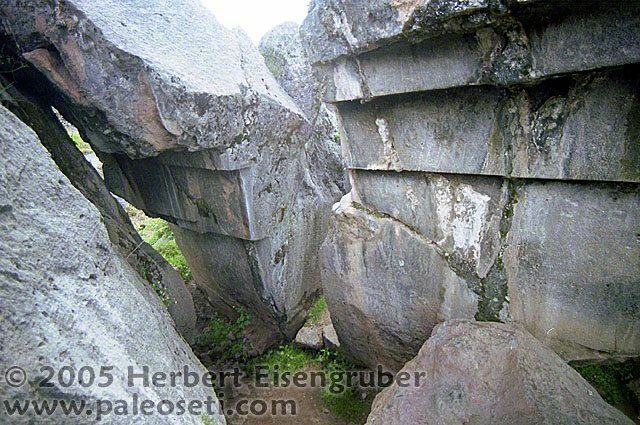 Everywhere you can find stones that are carved in the typical Inca style. Like this small stone circle here. But there is even better stuff! 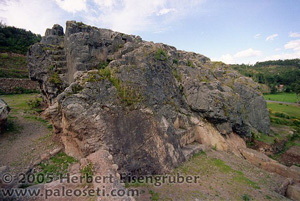 This monster rock is about 40m long, 30m wide and 20m high. 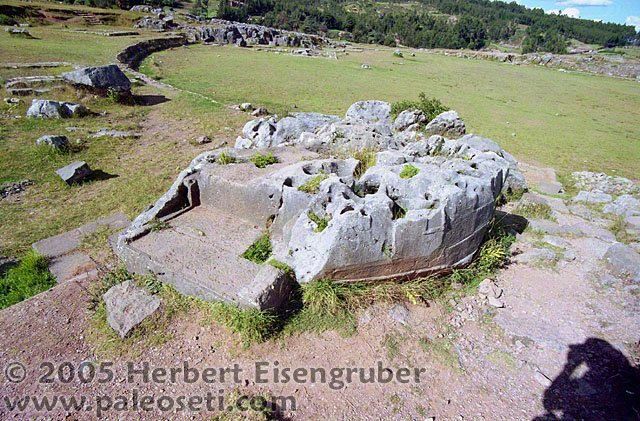 According to the legend, this rock was once moved (!) and buried 3000 workers when it fell. I can't tell if that's true or not, but it's a fact that the whole block was carved. Again you see steps running upside-down. See next photo. 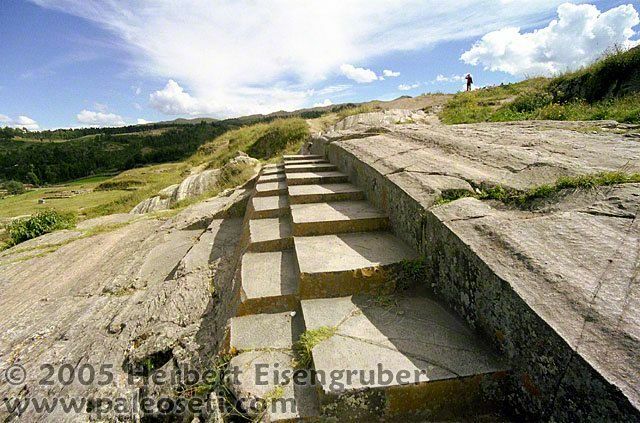 Again you can walk for hours in the area above Saqusayhuaman. Everything up here was carved and artificially arranged. And this not only in a small area. In a Taxi I drove on the road that leads to Pisaq. 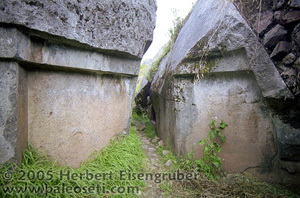 Left and right next to the road over a distance of at least 7 kilometers one can see carved rocks that look as they were turned upside down. 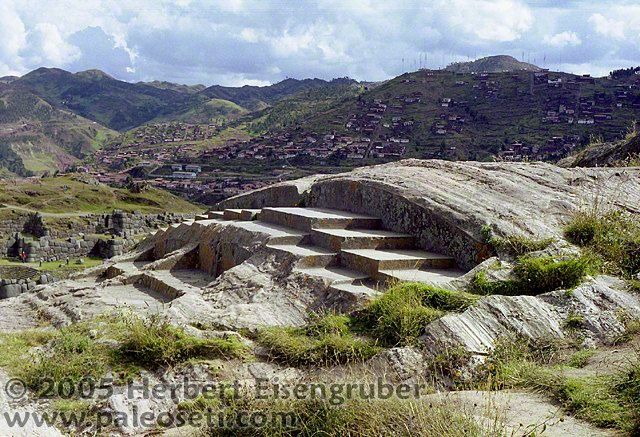 It almost seems as if there was an ancient city long, long before the Inca. And it also seems the Inca built there stunning buildings on those ancient remains. 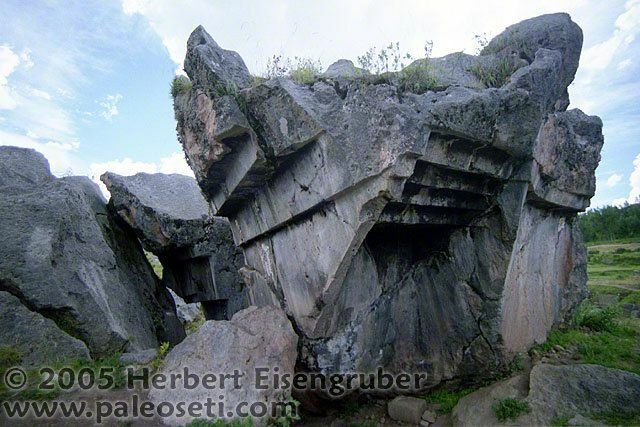 Did the Inca inherit the tools to carve there magnificent stoneworks from this older culture? 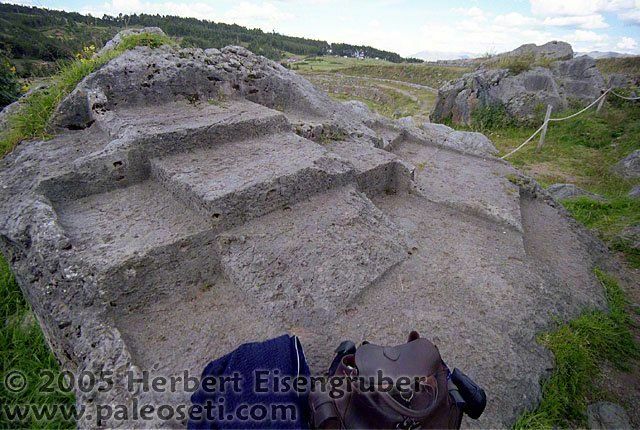 Or did they find the tools with which the older structures were built with? The precision and seeming ease of how the granit was worked is staggering and can only be explained with advanced technologies and techniques. In recent years laser cutting technology has advanced greatly. Technologies like these could explain the rock carvings above. In order to show you some rock cutting techniques with lasers I would like to show you two video clips of state-of-the-art laser drills.